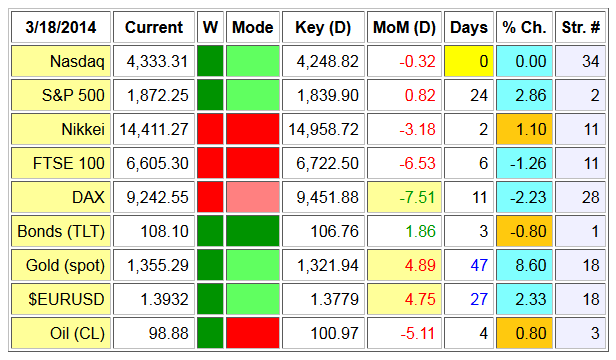 * Several changes in our key reversal levels today. * Nasdaq has jumped back into bullish mode. But the move is suspect as the breakout happens with MoM remaining to the downside. So could turn out to be a fake out move. * DAX is the first market that sees MoM turn upwards, so may have bottomed for now. Daily key level at 9451 is now the first upside target. * Gold and $EURUSD have seen nice rallies in recent weeks, but MoM is turning down on them. That means they probably peaked for a while and are setting up for a test of their daily key reversal levels. Staying cautious as long as MoM goes down. PS: to get the key reversal levels for other world markets or individual stocks, follow me on Twitter. * The Nikkei has closed above its weekly key reversal level and is now bullish again. But it could be a fake out move as its weekly MoM remains to the downside, which is suspect. If Nikkei moves above 15500 we can become more confident that this rally is for real. * US and UK markets are once again testing their Top1 targets and seem to be stalling near these levels. Daily MoM remains to the downside for Nasdaq and FTSE 100, while the DAX continues to weaken. It looks like most markets will need another pullback before they can climb higher. * Bonds (TLT) are weakening as well. Weekly MoM is turning down and on the daily level bonds have fallen below their key reversal level, putting them into declining mode. If TLT closes below 105.03 next week it will enter fully bearish mode. * We have a new Top2 target for gold at $1541. This targets will come into play if gold can break above its Top1 target. PS: if you are looking for key reversal levels for other world markets or individual stocks, then follow me on Twitter. We also try to tweet the daily key reversal levels every day. * Today we see momentum (MoM) turn down for the DAX and for gold. So, they are now in mildly bullish mode, which means they may have peaked for a while. * When MoM turns down after a rally, it is generally a good idea to take partial profits. We see that the DAX is up 1.2% since it went into bullish mode 7 days, while gold is up 5.97% since it turned bullish 29 days ago. Taking partial profits means you remove the risk from the remaining position, and then you just keep using the key reversal level as your stop-loss. This will gradually lock in more profits until the market goes into bearish mode eventually. * MoM turning down after a rally is also the point where you can initiate speculative short positions to benefit from a possible pullback or correction. It is important to estimate risk/reward before going short when MoM turns down. The risk depends on how far the entry price is away from a recent high (as we will need to use a stop-loss just above a recent high). The reward can be estimated from the key reversal table. If the given market is strongly bullish (dark green) on the weekly(W) level, as is the case for gold, then the daily key reversal level is going to be the approximate profit target. E.g. for gold we see the key reversal at $1274 , which is about 50$ below the current levels. The recent high for gold was $1333.2, which is about $10 above curent levels. So, the risk on a short trade would be ~$10 with a profit potential of ~$50. That’s OK for a quick trade. But one has to reassess the risk and reward every day, because the daily key reversal will come up (reducing the remaining potential in the trade). So, if all goes well, only $35 or $25 of the profit potential may be realized. That’s still not bad for a $10 risk. * This is just an example of how key reversal levels can be used. Stay tuned for more strategies when my upcoming ebook is ready. * Major stock indexes are still bullish on the weekly level. * We see some weakness for the DAX where MoM is turning down again. * MoM is turning down for $EURUSD, so this market could turn bearish very soon. * Oil has failed to break above its weekly key reversal level, so bear market continues. * Stock market rallies are in jeopardy. MoM is turning down from very optimistic +8 levels, and most markets are not far above their daily key reversal levels. This means we are at an elevated risk for a sizable drop if the key reversal levels get broken on a closing basis. The weekly key reversal levels (see above) then become the first downside targets. * Oil fell, below its key reversal level last Thursday and has thus gone into declining mode as well. * Covered stock indexes continue to be bullish on the weekly level. Weekly MoM remains to the upside, with the exception of Nikkei. * Bonds (TLT) seem to have missed the chance to go into bullish mode. Weekly MoM is still positive, but time is running out and a continuation of the bear market is becoming increasingly likely. * For gold we see weekly MoM turning back down again this week. Gold hasn’t been able to climb above its weekly key reversal level and the bear market continues. Patience required. * The EURUSD continues to weaken as well. It is coming very close to testing its key reversal level at 1.3288. * Daily momentum (MoM) continues to go down for all covered stock indexes. Most markets (except Nikkei) have kept above their key reversal levels, so they remain in rally mode but we have to monitor ongoing developments closely. * Bonds (TLT) are in declining mode and no signs of the MoM indicator turning up. * Gold has fallen below its daily key reversal level last week and is now in declining mode again. Too early to buy. * $EURUSD continues to sink and its momentum remains down. * Oil (CL) has stabilized near our bottom target at $94 and the daily MoM is turning up from a very depressed level. That makes oil a speculative buy at this point, but a further drop towards $89 cannot be ruled out, so I wouldn’t risk more than $1/barrel on it. * There is a new top target for $EURUSD at 1.42. * The Nasdaq continues to push into its 3930-3975 top target. A second or third attempt is often successful. If it breaks out to the upside then start watching for 4200. * In the gold market we can set sights on the first bottom target near $1215. * Oil has survived the first test of its $94.30 bottom target. Note: if you are looking for key reversal levels for other world markets or individual stocks, then check out my Twitter account. I cannot cover every market or stock, but I do plan to increase coverage. Here on the blog I will stick to my weekly post covering the reversals for major markets, gold, oil and euro/usd. The rest goes out through twitter. If you have any question or suggestion, just use the comments space here. * Covered stock indexes remain bullish, with Nikkei showing some weakness in the form of falling momentum (MoM). 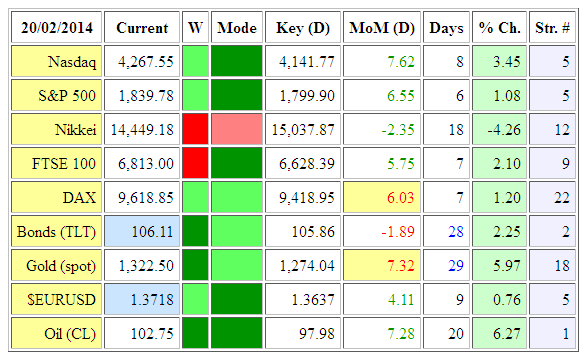 All markets stay well above their weekly key reversal levels. * Bonds (TLT) have stagnated just below their weekly key reversal level. A weekly close above 109.10 would be a long term bullish sign. * The EURUSD has weakened and its weekly MoM has now turned down. A weekly close below 1.3288 would indicate the start of a bear market for the Euro. * The Nikkei continues to show weakness and all other covered stock indexes are now also displaying a declining MoM, which is typically the first warning sign after a rally. This means a downturn could be imminent. Not a bad idea to take some profits here, or move your stops closer to the market. * Bonds (TLT) have fallen below their daily key reversal and are now in declining mode again. The recent rally has failed to lift bonds above their weekly key reversal level, and this suggests the path of least resistance remains down. * Gold has not done so well last week, and is only barely holding above its daily key reversal level. MoM has turned down as well. * $EURUSD has weakened significantly and crashed below its daily key level last Thursday. A clear sign to sell Euro. * Oil (CL) has dropped further, but the daily MoM is turning up, which means oil is getting ready for some rebound move. * There are new top targets for Nasdaq at 4200, for DAX at 9480, and an adjusted target for FTSE 100 at 7150. * The Nasdaq continues to stagnate at its 3930-3975 top target levels. * The FTSE 100 has touched its 6800 target and reversed promptly. * $EURUSD came within 1% of its 1.3950 top target, and then sold off. * Oil has nicely reached its $94.30 bottom target. Look for oil to find some support at this level. If not, the door to $89.50 will open.